MANILA, Philippines – The 'April 2017 NAPOLCOM Exam Results' for PNP Entrance and Promotional categories, together with the list of passers, top twenty (20) examinees and related announcements are available at this website as NAPOLCOM officially released the results online eight (8) weeks after the date of exams. NAPOLCOM Vice-Chairman and Executive Officer Atty. Rogelio T. Casurao announced that a total of 2,026 or 7.63% out of the 26,561 examinees passed the Philippine National Police (PNP) Entrance exams while 2,440 out of 6,634 (36.78%) passed in the PO exams and 2,648 out of 7,819 (33.87%) hurdled the SPO Exam. The results of the Police Inspector and Police Superintendent exams will be available soon. The low passing rate in the entrance exam may be attributed to the Commission’s continuous upgrading of standards on its police examinations in line with its sustained effort to professionalize the PNP by ensuring that only the best and most qualified individuals are admitted in the police service. The entrance and promotional exams are administered by the National Police Commission (NAPOLCOM) on April 23, 2017 at NAPOLCOM testing centers in the cities of Makati, San Fernando (La Union), Tuguegarao, Basco (Batanes), Angeles (Pampanga), Calamba, Bacoor, Palawan, Calapan, Sablayan (Occidental Mindoro), Romblon, Marinduque, Legazpi, Iloilo, Cebu, Tacloban, Calbayog (Samar), Pagadian, Zamboanga, Cagayan de Oro, Davao, Koronadal, Baguio, Butuan, Cotabato (ARMM) and Bacolod. The tests are qualifying examinations for the following PNP positions: Police Officer 1, Police Officers 2 and 3, Senior Police Officer (for SPO1 to SPO4); Police Inspector (for Inspector and Senior Inspector); and Police Superintendent (Chief Inspector and Superintendent). According NAPOLCOM, notification of results for April 2017 NAPOLCOM Entrance and Promotional Exams will be posted at NAPOLCOM Central Office located at DILG-NAPOLCOM Center, NAPOLCOM Building, EDSA corner Quezon Avenue, West Triangle Quezon City 1104 or at NAPOLCOM official website. Results will also be posted at regional offices nationwide. A Report of Rating (RR) will be mailed to the examinee's mailing address while verification can be made at Examination Division, Personnel and Administrative Service (PAS), NAPOLCOM central office. Meanwhile, examinees who didn't received RR can request certification from the same office upon payment of 150.00 pesos. The three-hour PNP entrance examination covered topics from General Information (Philippine Constitution and History; Philippine Law and History; Criminal Justice Systems; Current Events; Social Awareness and Value Judgement), Verbal Reasoning (Vocabulary; Comprehension; Grammar), Quantitative Reasoning (Basic Concepts; Problem-Solving Skills) and Logical Reasoning (Verbal; Non-verbal). The PNP promotional exams covered topics from General Information, Police Administration, Police Operations and Values and Ethical Standards. Philippine National Police (PNP) entrance and promotional tests are conducted twice a year by the commission. During October 2016 of the same exams, 2,946 of the 25,462 examinees passed the PNP Entrance Test while 2,727 of the 15,109 passed the promotional exams. On April 2016, a total of 2,705 out of the 22,541 examinees passed the entrance exams while 5,426 out of the 18,839 examinees passed in the promotional exams. According to Atty. Casurao, the above-recorded low passing rate for both exams may be attributed to NAPOLCOM's continuous upgrading of standards on its police examinations in line with its sustained effort to professionalize the PNP by ensuring that only the best and most qualified individuals are recruited and promoted in the police service. Meanwhile, below is the statistics of NAPOLCOM results in the last three (3) exams. PNP Entrance Exam is open to all Filipino citizens who meet the age, height and educational requirements set forth by the commission. Meanwhile, the PNP Promotional examinations only open exclusively to all qualified members of the PNP who meet minimum qualification standards for examination in terms of rank and eligibility. Applicants may proceed to any NAPOLCOM Regional Centers for further details. 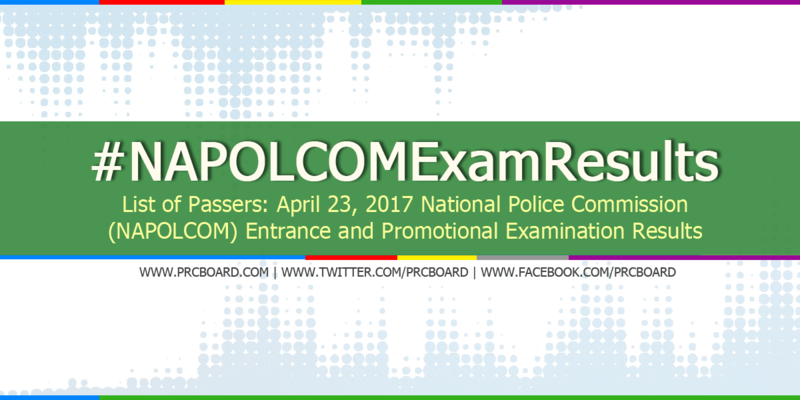 To receive up-to-date news about April 2017 NAPOLCOM exam results, we advise our visitors to visit NAPOLCOM official website, bookmark this page or follow us at our social media pages via Facebook and Twitter. With God on your side, nothing is impossible. Good luck everyone! Keep the faith. Hi admin san po makikita ang buong list of result ng exam passer ng police inspector ? anopo passing points pag nag take ng police entrance exam?